Animals make me very happy. I don't really know why I am so drawn to them, maybe it's their innate authenticity, despite them not speaking english you are left with no uncertainty of their meaning. I suppose they are like children but for most of their lives; honest and loving. My poor Mum was dragged every Saturday to Duffy's Forest for horse riding lessons from when I was 7. And our driving holidays always took a lot longer than Dad would have liked as we had to stop at any horse that had it's head any where near where I could reach over and give it grass and have a natter. I thought I would be assured of having a dog in my adult life as I did in my childhood, but my farm boy hubby doesn't feel the same way and then little people popped along. So when I can get more than 5 hours sleep in a row and the boys are able to dress themselves a puppy is on its way to us whether my beloved hubby likes it or not! In the mean time I ask generous dog owners whether the boys and I can have a pat or get my fix, luckily a lot closer to home. Today we went to Calmsley Hill City Farm only 40 mins drive from the inner west. It was like the easter show but cheaper and less soul-destroying. And last week we went to The Grounds at Alexandria and met Kevin Bacon, a gorgeous and very friendly miniature pig and some chickens. You can also get a horse ride at Centennial Stables - five minutes from the centre of the city, and where I used to ride the two horses you see below. Learning to jump in Centennial Park was amazing. 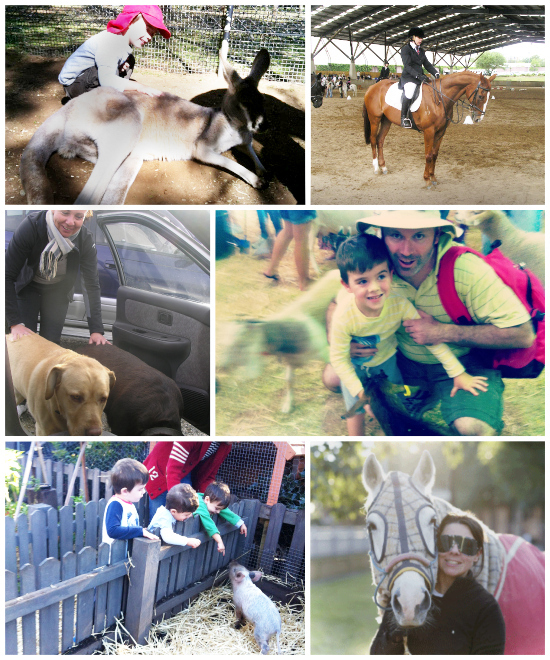 From top left clockwise: Calmsley Hill Farm, Norman at Centennial's indoor arena, Goats at the Easter Show, Max going for his morning walk at Centennial, Kevin Bacon at The Grounds and two Labradors I befriended on a holiday! Where do you get your animal-fix?